I tell you that you must surrender! That which is agitating your spirit and causing factions and arguments among you must stop. I am moving and having My way. I am answering your prayers. I am shaking, pruning and accomplishing My purpose because of your faithful intercession. But, you must lay down your preferences and opinions for no one will come through this year without surrendering something. There is a place in Me where true joy and freedom lie. It is the place where you lay down your life and all that you cling to and decide there’s nothing to lose – and nothing to gain. 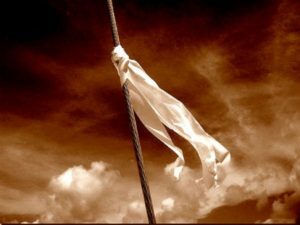 It is in that place of complete surrender that My Spirit will take over and set you free. I desire to release a fullness of joy and depth of revelation that will astound you. But, you must empty yourself of every personal ambition and desire and choose to LET ME lead. Your prayers for this nation are wielding great power, but not in the way you think. This is the hour when My sovereign choice is overriding man’s intervention and your prayers are not directing MY path as much as they are directing YOURS. I am purifying my Bride and sanctifying your hearts. My working has forced many to face their own demons and now is the hour for freedom. I am coming in the power of My Spirit, but you must be ready to receive that which I pour out. Learn to live in that place of total surrender and absolute trust to let Me have My way with you. In time you will see and understand that which I am putting in place. You cannot judge from the outer appearances of things but must discern by the Spirit. This will come as you spend time with Me in the secret place, for the more you know the Original, the more easily you will recognize any imposter or counterfeit (I Corinthians 2:14). You must choose mercy over judgment. Do not speak for me in this regard. I will do the judging and exposing. You simply watch and see that which I alone can uncover. Many are missing My purposes because they have taken offense. Do not let this divide you, but seek to stay in love with Me and with one another. This can only come through…surrender. I am coming with retribution and recompense. I am coming to shower this nation with My goodness and My mercy. This abundant goodness will come to those who know and walk in the fear of the Lord (Psalm 31:19-20). Do not just settle for my Presence as Moses did, but ask for my glory which is my tangible goodness in your midst (Exodus 3:18-19). I am coming to breathe life into this nation once again. Resurrection power is coming and those who have died to their own will and preferences will receive the first fruits of heaven’s outpouring. Delight yourself in Me and get used to having no agenda other than watching and following Me. I will put My plans in your heart and fulfill My purpose through you as you simply yield control and let Me have My way with you. Love Me with your whole heart and the rest will fall in place. I am not only doing a new thing in the earth, but I am doing a new thing in YOU! You may not recognize yourself in the days to come! But, as you gaze upon Me, you will reflect The One who will work mighty wonders on your behalf. All things will be possible! So, I say again – surrender! Open wide your arms, open wide your heart to the endless potential of heaven on earth. There is a blissful place for you and Me in this reality and celebration time is soon upon us. Regardless of what the enemy tries to do or say, know that My goodness is about to shatter the darkness as I am doing a new thing. Learn to perceive it and welcome it from afar. This rings so true. I am hearing voices raising this note all over the spectrum. Heaven is coming down to earth.